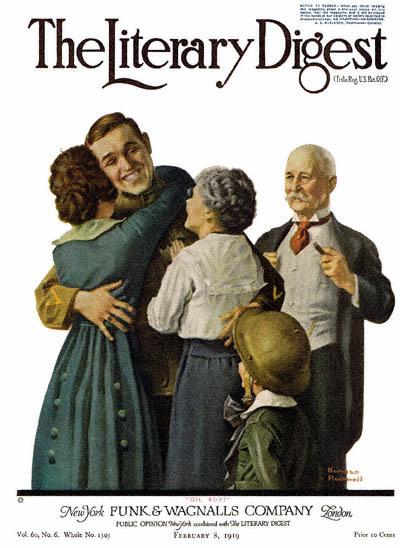 Soldier Reunited with Family, this Norman Rockwell painting, appeared on the cover of The Literary Digest published February 4, 1919. An alternate title for this work is Oh Boy. This painting was Rockwell's fourth picture featured on the cover of The Literary Digest. The Digest featured Rockwell on the cover nine times in 1919. Starting in 1918 with the first cover, Boy Showing Off Badges to the last, The Night Before Christmas in 1923, The Literary Digest featured Rockwell artwork on its cover a total of forty-seven times. The original oil on canvas painting, 27 x 25 inches or 68.5 x 63.5 cm, is part of the collection of a private collection. This painting has also been reproduced in Norman Rockwell, A Definitive Catalogue by Laurie Norton Moffatt on page 48. On January 18, 1919, a peace conference to end World War I was beginning in Versailles, France. The prayers of the whole world were finally being answered. Soldier Reunited with Family was only one of 47 Norman Rockwell Literary Digest covers; here is the list of more Norman Rockwell Literary Digest scans. Naturally, Norman Rockwell painted a illustration showing what that meant to the average American. Most Americans were interested in when the soldiers would return home. Americans missed and were concerned about their husbands, sons and fathers fighting overseas. This picture shows the joyful reunion of a returning soldier with his family. The emotion fairly exudes from the painting as the soldier hugs his wife and his mother. In the background, his father looks on happily. He is practically beaming. He is proud of his son for serving his country. He is also relieved to have his sone back home safe again. In the foreground, we see his young son playing soldier, wearing his father's helmet. Rockwell has strummed all our heart strings now.